I reduced the butter from 1 stick (8 tablespoons) to 4 tablespoons. I used heart healthy canola oil in place of the other 4 tablespoons of butter. It only has 1 gram of saturated fat per tablespoon as compared with the 7 grams in the butter. For the peanut butter, I only used one tablespoon in the bars themselves but used 1/2 cup in the filling. So that's kind of a wash. I also reduced the sugar by half. And guess what, no one ever noticed. We really don't need all that sugar in our desserts. It is just not necessary. The chocolate topping is a lighter version as well. It has no butter in it compared with my mom's original recipe which has 3 tablespoons. It is very deep in flavor, so if you love dark chocolate, these are for you! I think they turned out great. But don't take it from me, make them and see for yourself! Grease a cookie sheet. (Mine is about 12 x 8). Mix the sugars and butter until light and fluffy. Mix in the oil, egg, and peanut butter. Add baking soda, salt and vanilla; mix well. Add flour and flax seed if using; mix until just combined. Add oatmeal and mix until just combined. Push dough evenly into cookie sheet with fingers. (Cut a sheet of waxed paper the same size as the cookie sheet and place over the dough. It will be a lot easier to spread the mixture into the pan. Remove waxed paper). Bake around 18 to 20 minutes depending on your oven, until they are light golden brown. In a medium bowl, beat together the peanut butter, cream cheese, vanilla and sugar. Mix until the sugar is completely incorporated. Spoon mixture in between 2 sheets of waxed paper (cut the same size as the cookie sheet). Roll out to within 1/2 of the edges. Remove top sheet of waxed paper and place on top of the cooled peanut butter fingers. Carefully remove the top sheet of waxed paper. Refrigerate to chill. Top with chocolate topping. Heat water and chocolate in a small saucepan over low heat, stirring constantly. Add sugar and continuing to stir, bring to a boil. Stir until all the sugar has dissolved and mixture is slightly thickened. Take off heat and stir in extract. Pour over chilled bars. Spread evenly to cover. Refrigerate until ready to serve. OMG, those look fantastic! 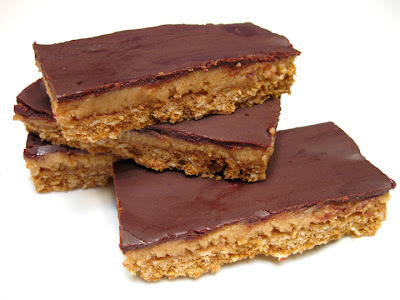 I cannot resist peanut butter bars! love it when notices :) these are another must-try! Wow...these look excellent! Yum! I love Reese's and a homemade version I'm sure is even better! Wow, peanut butter and chocolate is always a win win situation ;-) Your bars look yummie! Thanks for sharing it! These sound so good! I'll have to remember this recipe. Oh this is so unfair! I'm off peanuts while pregnant but now want nothing more than one of these bars. Great recipe. That seems like it would be a terrific Halloween Party treat. Oh no! It's not even October yet and I'm thinking of Halloween.